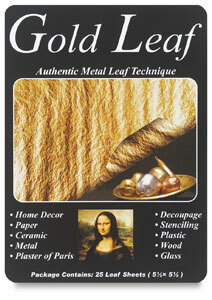 Looks and feels like gold leaf, but not recommended for outdoor use. Will tarnish or oxidize unless sealed with varnish. 25-sheet booklet, 5-1/2" x 5-1/2" sheets. ™ Mona Lisa is a trademark.